First, you must first decide what color tone your skin falls into. Are you creamy / porcelain, medium / olive, or dark? Different hues work best with different skin tones. If you are creamy / porcelain, your complexion looks best when accented with a “true” red (think crayon red) or a red/plum (such as the picture to the left). Those with olive / medium tones wear an orange red, bronze, mahogany, and medium to deep raisin the best. Dark purple, wine, and deep blue/red shades look fabulous on dark skin tones. When testing lipstick, use the inside of your wrist to help decide which color works best with your skin tone. 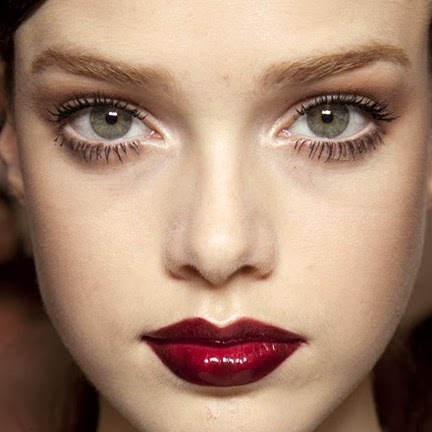 Line your lips with a liner that is slightly, darker than your lipstick. This helps to make the lips look fuller when blending with your lipstick color. Color in the corners of your lips with your liner. If you notice in the picture, the insides of the model’s lips look slightly darker. Rub your lips together to smudge the liner out to a thicker line. Apply the lipstick to your lips inside of the liner. The lighter color on the inside makes the lips seem fuller. See picture above. Rub your lips together to blend and lightly blot. With a powder brush, dust a little bit of loose powder on your lips to set the color, and then apply another coat of lipstick. This helps the color to last longer. Pick a sheer gloss that is one or two shades lighter than your lipstick color and apply to the center of your lips. Gloss in the center of the lips gives the appearance of a pouty lip. Rhubarb Lipstick and Vintage Liner in my line Adel Amor Cosmetics will give you the same look as the model above. Click here to checkout Adel Amor Cosmetics.